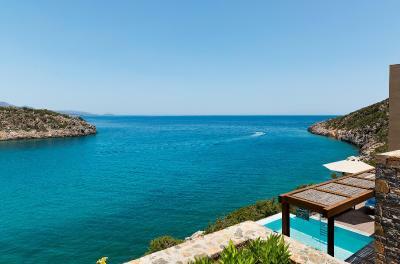 Lock in a great price for Daios Cove Luxury Resort & Villas – rated 9.2 by recent guests! The property is beautiful! Loved the private beach and pool area. Buffet was plentiful. 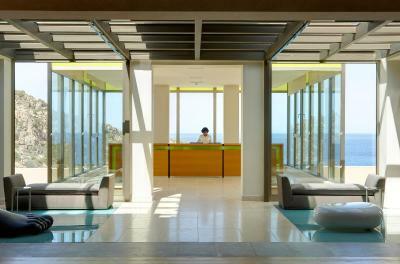 Fantastic resort with great staff (always helping with a smile!). Restaurants are excellents as well. We will come back! Wonderful setting, excellent food, beautiful bungalows, very friendly people and guests - thank you for everything! 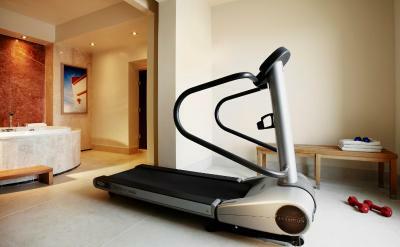 -I loved the location, the room and the facilities. -We loved the main restaurant buffet -We had very good service most of the time -We didnt want to leave the place, perfect for relaxing days in a paradise. 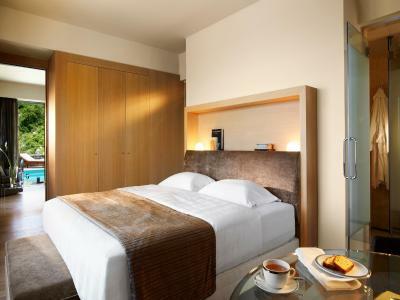 A stunning location, a beautiful hotel, rooms and facilities of a high standard, a nice and friendly staff. The place is unique. Very clean. Very quiet. Pesnonel excellent very friendly people. Quality meals. The Gourmet restaurants is a must. Really a 5 star hotel! Thank you guys! Daios Cove Luxury Resort & Villas This rating is a reflection of how the property compares to the industry standard when it comes to price, facilities and services available. It's based on a self-evaluation by the property. Use this rating to help choose your stay! 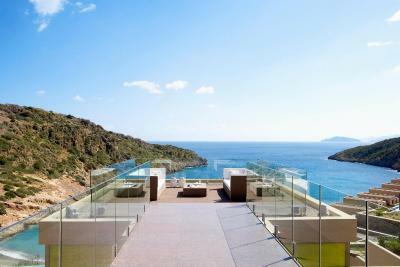 On a hillside overlooking its private bay on the northeast part of Crete, Daios Cove features 165 private sea-water pools, a 27,000-ft² spa, and luxurious rooms with spectacular views of the cove and the sea. 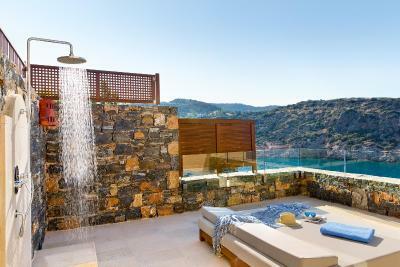 The elegantly designed Daios Cove rooms, suites and individual villas offer spacious living areas and marble-lined bathroom with separate bathtub and rain shower. 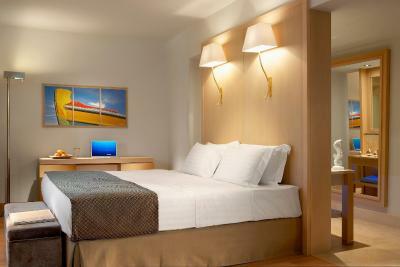 Amenities include free Wi-Fi, flat screen TV with iPod access, personalized pillow menu and coffee/tea maker. 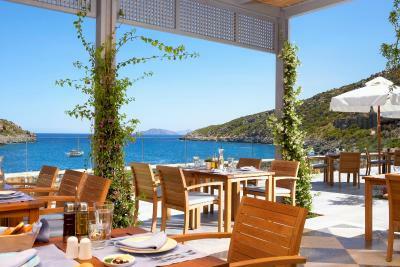 At the Pangea, guests can enjoy breakfast overlooking the crystal waters of the cove. At night it turns to an International food bazaar with lots of International theme nights. A lighter fare is served at the Ocean Club. The Greek Tavern is set at the water's edge and offers local specialties and daily fresh catch. Recreational amenities at Daios Cove Luxury Resort & Villas include 2 tennis courts, 2 outdoor pools, water sports, kids club, complimentary wireless Internet access and a 21,500-ft² conference center. 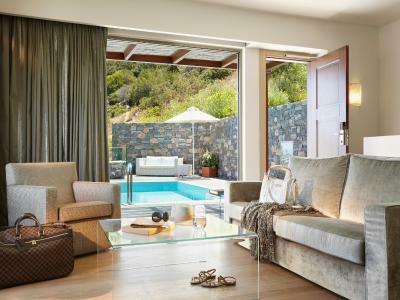 Daios Cove Luxury Resort & Villas is 20 minutes from the fishing village of Elounda, 10 minutes from the cosmopolitan town of Agios Nikolaos and less than an hour from Heraklion International Airport. 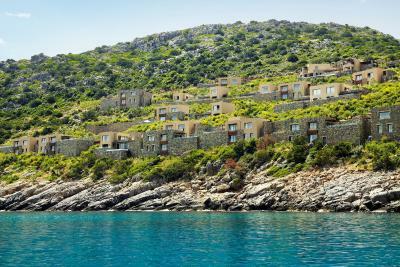 When would you like to stay at Daios Cove Luxury Resort & Villas? 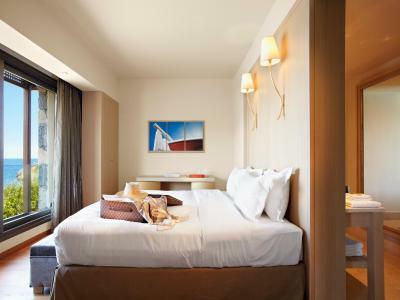 Elegantly designed rooms, consisting of one spacious bedroom, with living room in open plan style, marble-lined bathroom with separate bathtub, shower cabin and private balcony with view of the sea. 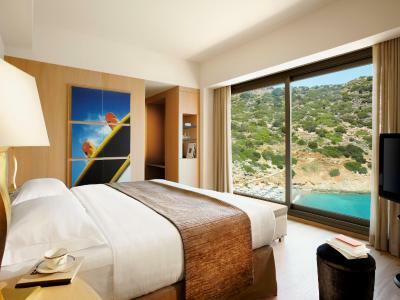 Spacious suite with private pool and bedroom, separate living room, lavish marbled bathroom and private terrace with unlimited view of the hotel’s private cove and the Mediterranean Sea. 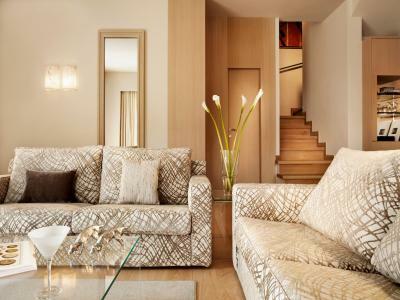 This spacious suite has a separate living room, lavish marble bathroom with a bathtub and shower, and private terrace with unlimited view of the hotel’s private cove and the Mediterranean Sea. 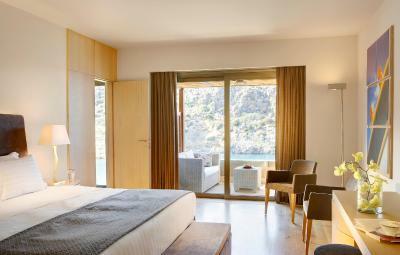 Directly located at the waterfront, these villas have spacious bedrooms and modern bathrooms with separate bathtub and shower cabin. 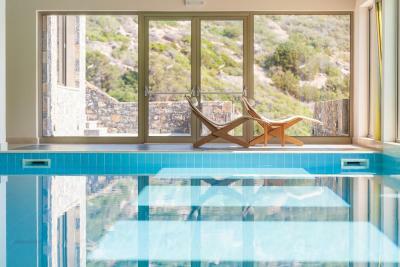 Guests enjoy the private heated seawater swimming pool and its spacious terrace. - use of the mini-bar. 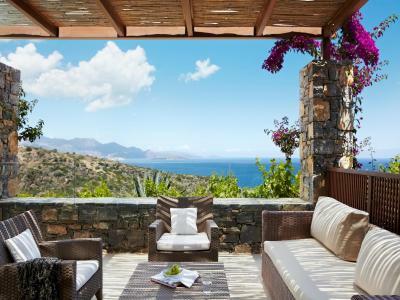 Guests of this villa enjoy Residents Club - All Inclusive benefits. 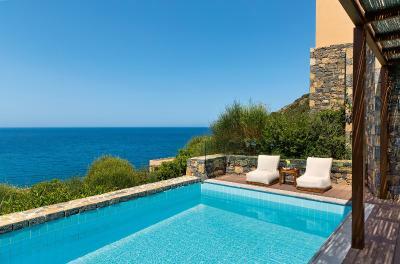 Located at the most exclusive and private area of the resort, these large 2-bedroom villas have a spacious sun deck area, independent living room with views of Daios cove, as well as a large seawater swimming pool. Featuring views over the sea, this two-bedroom villa comes with a private wellness area with Finish sauna, technogym treadmill and hot tub. 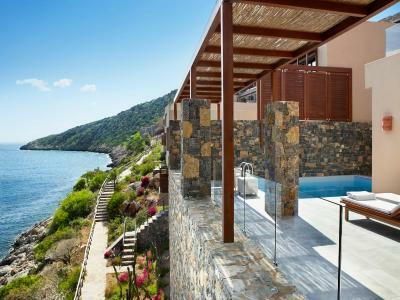 Features spacious seating area and bedroom in open plan style, marble-lined bathroom with separate bathtub and shower cabin and a generous terrace with private sea water pool overlooking Daios Cove. 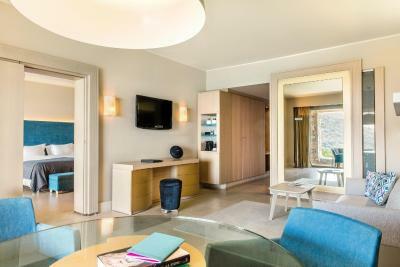 Guests of this suite enjoy Residents Club - All Inclusive benefits. 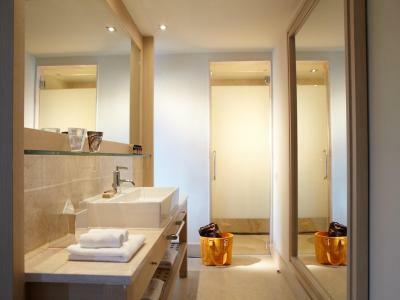 -2 bathrooms, each with shower cabin and bath tab. 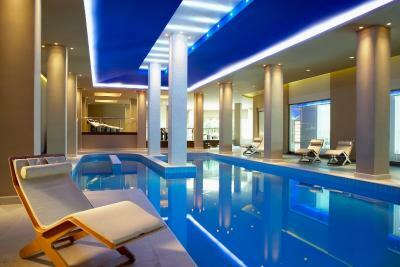 It’s the location which dazzles first. Once seen, it’s never forgotten. 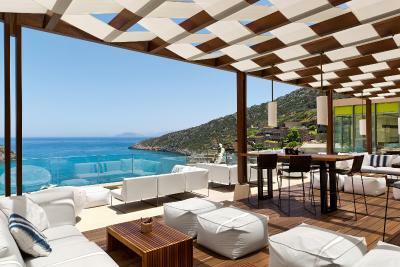 Set against the visual drama of a secluded bay, Daios Cove Luxury Resort & Villas nestles on a hillside on the beautiful northern coast of Crete. From every angle, the views are sublime: the calm turquoise sea in a quiet cove, spectacular verdant slopes, lush terraced gardens, a yellow crescent of private beach and a wide expanse of azure sky. 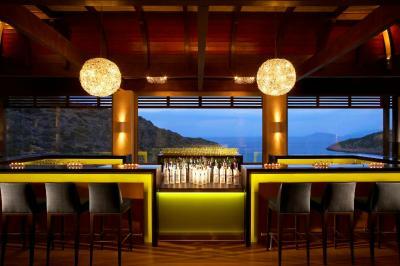 Daios cleverly combines five-star luxury and a select ambience with impeccable, friendly, always accessible service. 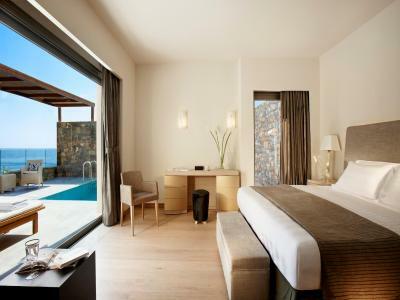 Guests have a choice of luxury villas, rooms and suites (many with their own private sea water pools), three restaurants, fitness centre, spa and kids’ club. 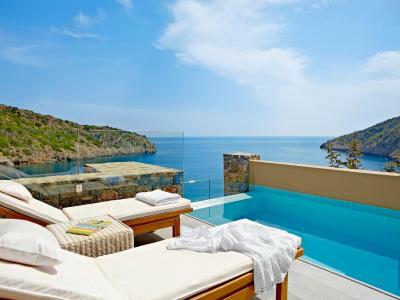 Whether relaxing on the exclusive beach, swimming in the pools, sampling ÿne cuisine, enjoying first class service or simply soaking up the unique atmosphere, Daios Cove makes the perfect luxury hideaway — and the ultimate holiday. 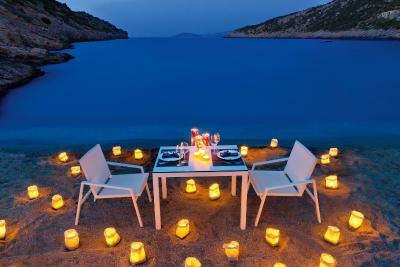 House Rules Daios Cove Luxury Resort & Villas takes special requests – add in the next step! Daios Cove Luxury Resort &amp; Villas accepts these cards and reserves the right to temporarily hold an amount prior to arrival. Daios Cove Luxury Resort & Villas accepts these cards and reserves the right to temporarily hold an amount prior to arrival. 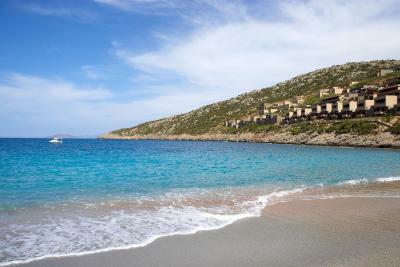 Please inform Daios Cove Luxury Resort & Villas of your expected arrival time in advance. You can use the Special Requests box when booking, or contact the property directly using the contact details in your confirmation. -The massage wasnt very good. 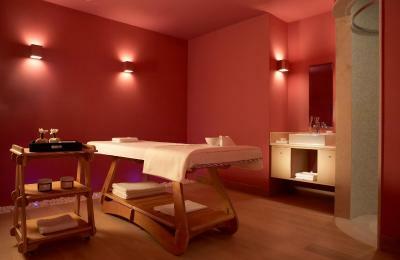 Staff was talking with each other and not concetrated on the massage. It wasnt worth it and we wouldnt do again. -It would be good to have toilets on the beach. -The DJ 'party' should be more excited. The restaurants are disappointing, the food is reasonable but we expected more from such a hotel, at OCEAN restaurant the food was particularly bad and although we complained we did not get any response. As accepted, half board accommodation does not include drinks (not even water at dinner), But the prices of food and drinks throughout the hotel are very expensive. Needed more entertainment I.e. dancing, bars etc. 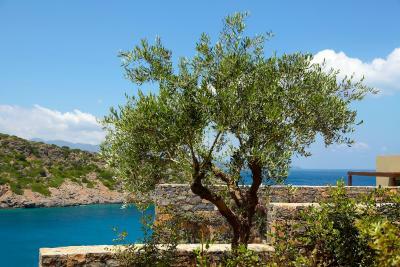 Location is lovely if you are happy to stay at the resort, but remote for travelling around Crete. Facilities are great, starting to get a bit tired. Staff try hard, but miss the mark of a high end resort. Housekeeping is terrible, rooms should be cleaned more thoroughly each day. 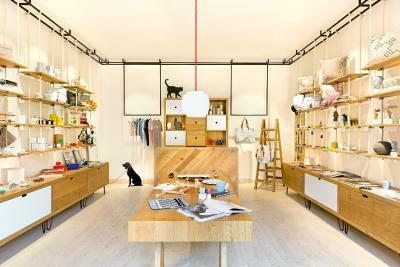 Everything you might want to buy in this place is a complete rip off. Drink, food and ice cream prices are ridiculous. You are offered a 30 euro credit to eat in other restaurants other than the buffet on half board basis. This would buy you a moussaka and salad in the taverna. The site is very sloping and there is a gondola to get from one level to another. Can be a little wait for it to come. There are a lot of children and babies in resort so not a lot of peace and quiet. The gondola doesn't go down to beach level so you have to negotiate a lot of steps to get to the beach. There are no toilets at the beach so access to toilets involves a lot of steps. 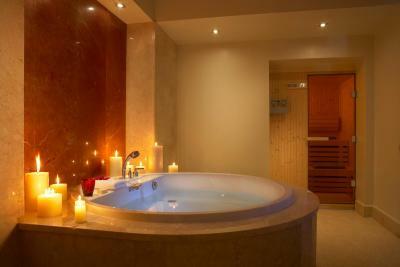 Luxury room in purpose built resort with fantastic bathroom, enormous bed and lovely balcony seating area. Beautiful setting overlooking a cove with nice sandy beach. 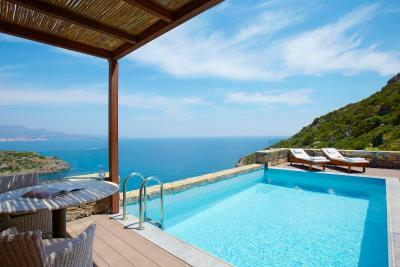 Beautiful infinity pool. Extensive and good quality food at the buffet restaurant for breakfast and dinner. Well equipped gym.